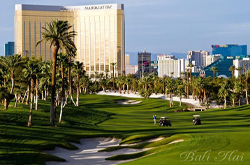 Conveniently located on the Las Vegas Strip and recognized by GolfWeek as one of the "Top 40 Resort Courses in America," Bali Hai transports golfers to a tropical island paradise. 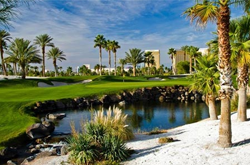 The course features seven acres of water hazards, a total of 4,000 trees, including 2,500 stands of towering palms and 100,000 tropical plants. 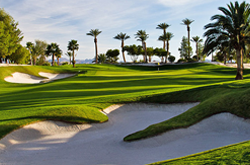 Transition and out-of-play areas are accented with Augusta white sand and black volcanic rock outcroppings.